Twelve years ago the roots for SOS Radio Week were laid down by David Hughes (M3LFC) who undertook a three month operating marathon to raise money for the Royal National Lifeboat Institution (RNLI). Aged just ten David achieved his goal and was presented with a special award by the RNLI for his efforts in raising £300. In 2007 the RNLI announced that it was going to run its first annual RNLI SOS national fund raising day on the last Friday in January and David and his dad, Derek (G7LFC), committed to do some fundraising for the event during the week leading up to the SOS Day. And that was it, SOS Radio Week was born. In 2008 other amateur radio operators (individuals and groups) were invited to raise money with David and Derek. The length of the event was extended to cover the weekend before and after SOS Day (nine days in total) to give participants the choice of which weekend to establish their special event stations. In reality David and Derek’s chosen lifeboat station’s, Lytham’s, inshore boat house is always flooded on one of the last weekends of January as the annual spring tide coincides with the end of January. And so it has remained since; a nine-day week. The RNLI probably came to the decision that fund-raising at the end of January isn’t nice; the weather can be really cruel in depths of winter, especially on the coast where lifeboats are traditionally located (yep there are some that are inland). 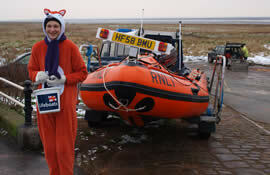 If you look closely at the photograph of Rebecca (M6BUB) collecting money outside Lytham Inshore Lifeboat Station during SOS Radio Week that is snow you can see on the foreshore and it was was sub-zero. She looks cold too, but she raised over £100 that day – she probably had the sympathy of the few passers-by walking their dogs and jogging. Whilst we hardy amateur radio operators were happy to brave the weather the RNLI decided to move their fund-raising day to, initially, May Bank Holiday (first weekend of the month) and then extend it to the whole month of May. The name of their fundraising event also changed to Mayday to reflect the change. To be fair, establishing and operating special event stations in the depths of winter on the coast can be a daunting prospect and there’s the added issue that there aren’t many visitors to the coast at the end of May. This results in there being few people around to see amateur radio in action and for us to promote our hobby and the RNLI to the general public. So after much thought and consultation with a few regular participants we’ve decided to move SOS Radio Week so that it, once again, falls in line with the RNLI’s own fund-raising event; something it was conceived to do. And, since the RNLI can stretch one day to last a whole month, we thought we’d magically stretch one week to last a whole month. So that’s how we have arrived at the change. Stations can now choose from four (sometimes five) weekends to establish and operate their special event stations. Stations can run multiple special event stations during the month if they wish. The weather should be much better and winds less violent making the establishment of the station much easier and safer. 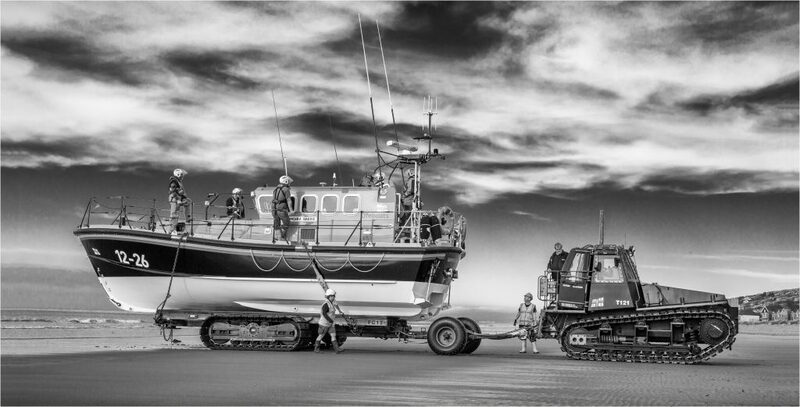 There will be more visitors to which we can promote our hobby and the RNLI. Money’s not so tight as the few weeks following Christmas, so there is the potential to raise more money for the RNLI. We hope you’ll all agree that this is a good move and that we can count on your support next year. We’re ready to take your registrations for SOS Radio Week 2018, so register here.